Azure PowerShell can be used to control and automate the deployment and management of your workloads in Azure. In this article, you learn how to manage Apache Hadoop clusters in Azure HDInsight by using the Azure PowerShell Az module. For the list of the HDInsight PowerShell cmdlets, see the Az.HDInsight reference. The PowerShell Az Module installed. You can also delete a cluster by removing the resource group that contains the cluster. Deleting a resource group deletes all the resources in the group including the default storage account. 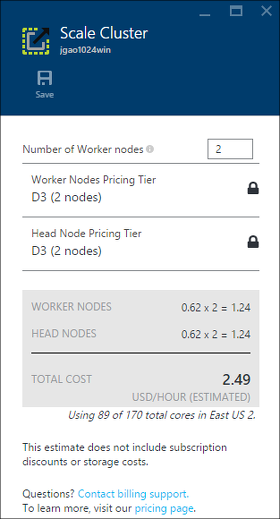 The cluster scaling feature allows you to change the number of worker nodes used by a cluster that is running in Azure HDInsight without having to re-create the cluster. You can seamlessly increase the number of worker nodes in a Hadoop cluster that is running without impacting any pending or running jobs. New jobs can also be submitted while the operation is in progress. Failures in a scaling operation are gracefully handled so that the cluster is always left in a functional state. When a Hadoop cluster is scaled down by reducing the number of data nodes, some of the services in the cluster are restarted. Restarting services causes all running and pending jobs to fail at the completion of the scaling operation. You can, however, resubmit the jobs once the operation is complete. You can seamlessly add or remove data nodes to your Storm cluster while it is running. But after a successful completion of the scaling operation, you will need to rebalance the topology. Refer to the Apache Storm documentation for more details. $clusterName = "<HDInsight Cluster Name>"
$hadoopUserPassword = "<Enter the Password>"
#$credential = Get-Credential -Message "Enter the HTTP username and password:" -UserName "admin"
By granting/revoking the access, you reset the cluster user name and password. Granting and revoking access can also be done via the portal. See Manage Apache Hadoop clusters in HDInsight by using the Azure portal. It is the same procedure as Grant/revoke HTTP access. If the cluster has been granted the HTTP access, you must first revoke it. And then grant the access with new HTTP user credentials. The values for DefaultStorageAccount, and DefaultStorageContainer are not returned from Get-AzHDInsightCluster when secure transfer is enabled on the storage account. echo "Default Storage account name: $defaultStorageName"
echo "Default Storage account type: $defaultStoreageType"
echo "Default Blob container name: $defaultBlobContainerName"
echo "Default Storage account key: $defaultStorageAccountKey"
See Run the MapReduce examples included in HDInsight. See Run Apache Hive queries using PowerShell. See Run Apache Pig jobs using PowerShell. See Use Apache Sqoop with HDInsight. See Use Apache Oozie with Apache Hadoop to define and run a workflow in HDInsight. See Upload data to HDInsight.